Rescuers are caring for 2,000 flamingo chicks after they were abandoned by their parents in South Africa, conservationists say. 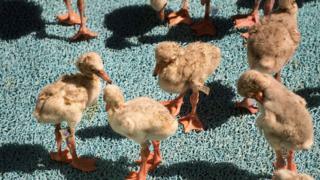 The baby birds were left in sweltering heat when the water dried up in Kamfers Dam, in the Northern Cape province. They had to be transported 950km (590 miles) by air to a conservation centre in the city of Cape Town. They are being carefully looked after until they are healthy enough to return to their home in the wild. Kamfers Dam is home to tens of thousands of this particular breed, the "lesser flamingo" - but harsh summer heat and a reported lack of water being pumped into the dam caused the area to dry up. It is not known exactly why this caused so many adult flamingos to abandon their chicks. When news of the birds first broke at the end of last month, experts from the Society for the Prevention of Cruelty to Animals (SPCA) and other welfare groups immediately inspected the site to see what they could do. The tiny birds were then flown to different places where they could be cared for, including Cape Town. Now, footage from the Cape Town centre, the South African Foundation for the Conservation of Coastal Birds (Sanccob), shows the tiny flamingos splashing about and occasionally pecking each other in little dishes of water. Nicky Stander, Sanccob&apos;s rehabilitation manager, told AFP news agency that they are recovering well, and will eventually be released back into the dam. "As time goes on and they grow, we are going to have to adapt the way that we house them and make sure that they have long running space so they can exercise their legs," she said. Mark Anderson, CEO of another bird welfare group called BirdLife South Africa, commended the rescuers&apos; quick action. However, he questioned whether "the decision to step in and remove the abandoned chicks and eggs [was] the right one". "Did the activity of the rescue parties working so closely to the flamingos still actively tending nests have a further, deleterious effect on the colony?" he wrote in a statement on Wednesday. "BirdLife South Africa has had observers at the site for the last week, and we are happy to report that the colony [in Kamfers Dam] is still healthy, vibrant and productive."